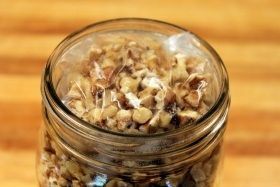 This is the recipe for a jar of dry mix to have ready for future batches of banana oat nut bread. 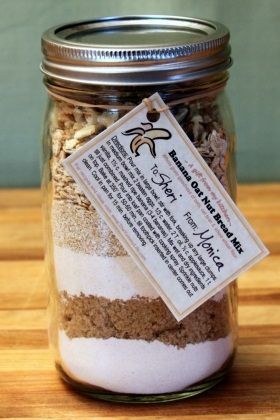 Or, you can give these jars of mix as gifts along with a tag with instructions for adding wet ingredients to produce a final loaf. 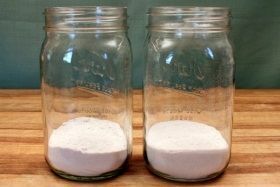 Layer 1 (bottom layer) - whisk together the white flour, buttermilk powder, baking soda, salt, & cinnamon and add it to the bottom of the jar. 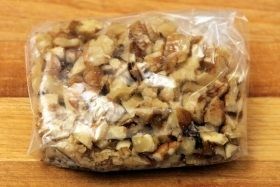 Layer 7 - 1/4 cup chopped walnuts wrapped in plastic. 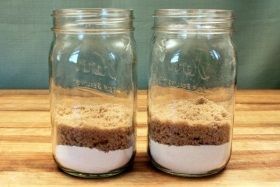 I mentioned in my post about Banana Oat Nut Bread that I like to make up extra jars of the dry ingredients to have on hand for future batches. It's a big time saver. When I have some over-ripe bananas, all I have to do is pour the jar of dry mix in a bowl, add the wet ingredients, and...PRESTO...Banana Bread! 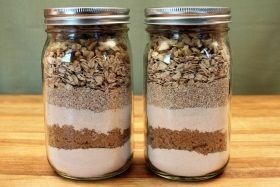 Another great thing about making up jars of this dry mix is that I have an instant gift on hand when I need one. That's what happened when my friend, Sheri, came by last week. Sheri has been a tremendous help to me in getting The Yummy Life blog off the ground. I've mentioned her online yarn store before. It's called The Loopy Ewe and has a mouth-watering selection of yarn colors and textures, along with all kinds of cool knitting necessities--check it out at TheLoopyEwe.com. Sheri has been blogging for several years, and I have learned a ton from her. Even if you're not a knitter, you'll enjoy her blog. You'll find recipes and all kinds of entertaining tidbits and ideas there. And you may even find yourself tempted to start knitting when you see the cool stuff she has! Sheri's a little loopy; but truthfully, she has to be to want to hang out with me. 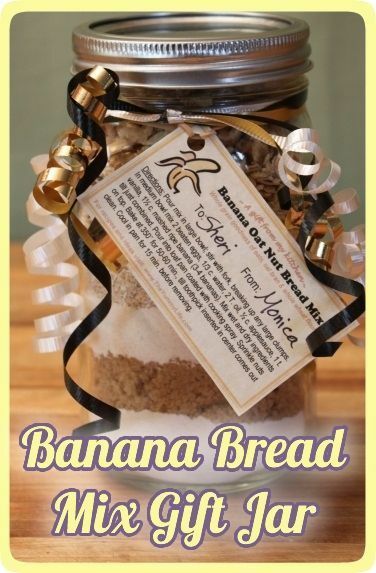 Anyhoo...I wanted to give Sheri a little token of my appreciation for all her help, so I gave her a jar of my banana bread mix--put it in a basket just to fancy it up a bit. 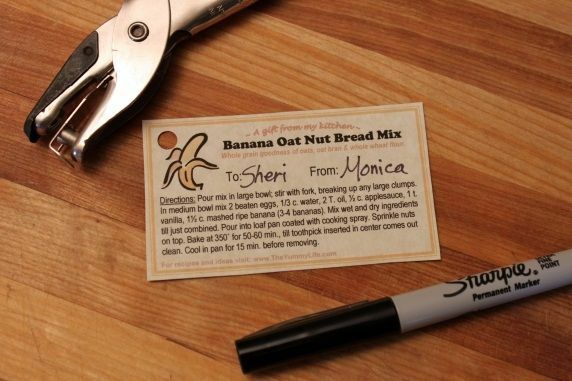 I attached a tag to the jar that had instructions for using the mix to complete her own batch of Banana Oat Nut Bread. Whether you're making up extra jars of this mix for your own use in the future or to give as a gift, here's how. 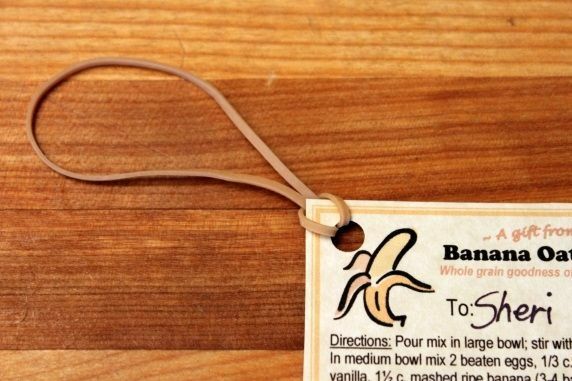 Here are step-by-step photos for assembling a Banana Bread Mix Gift Jar. You'll need all of the dry ingredients used in a batch of Banana Oat Nut Bread. 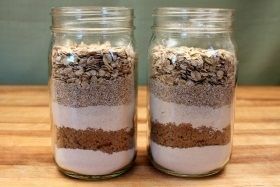 The recipe for the dry mix is at the end of these photos. 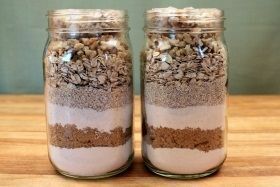 Although you could mix all of the dry ingredients before adding them to the jar, it makes a more attractive presentation if they are added separately so that you can see distinct layers of ingredients in the jar. 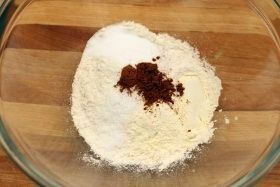 This whisked mixture is Layer #1 that goes in the bottom of the jar. 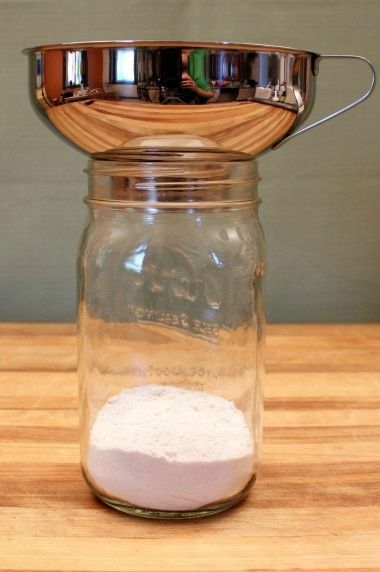 If you have a canning jar funnel, it makes it really easy to add the ingredients. If you don't have a funnel, use a 1/4 cup dry measuring cup or a spoon. 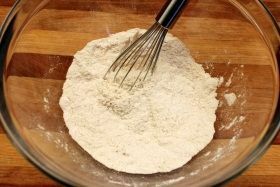 Use the end of a wooden spoon or something similar to level and tap down each layer before adding the next one. The jars of banana bread mix are ready! 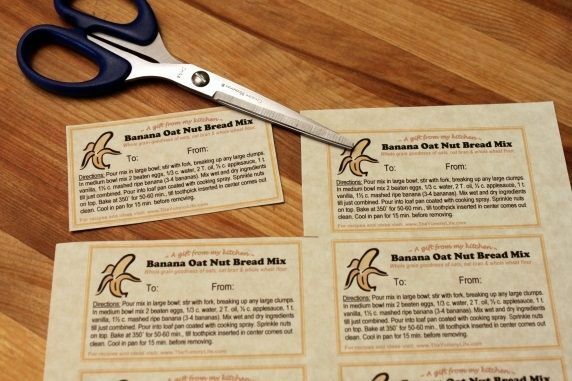 First print out a sheet of gift cards with cooking instructions. You can print on whatever paper or card stock you like. I used a natural-colored card stock for mine. Cut a gift card from the sheet, cutting carefully just outside the border. Loop a rubberband through the punched hole--this makes it very easy to attach to the jar. Or, you can use string, yarn, or ribbon. Stretch the rubberband around the jar with the tag hanging in the front. Or, tie it with string, yarn, or ribbon. Add some curly ribbon, if you like a little fru-fru. Your jar is ready to use or give. 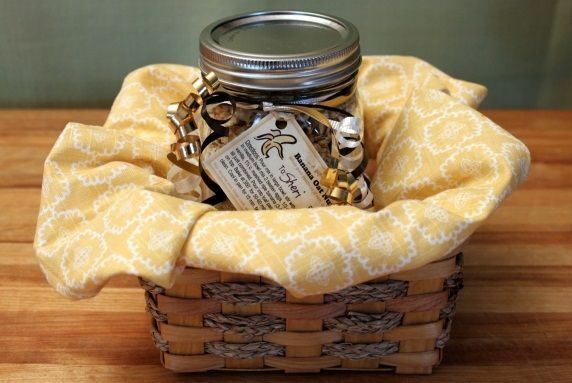 Or, you can decorate the jar even more by tying a circle of fabric or wrapping paper over the top. 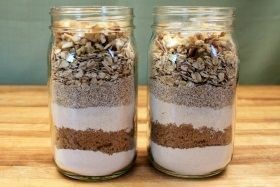 See my Granola Gift Jar post for those instructions. If you'd like to turn this into an easy gift basket, here's how. *You can purchase these snack-size containers of applesauce that are in 1/2-cup portions--exactly the amount needed to make the banana bread. It's a nice thing to add to the basket, since not everyone keeps applesauce in their pantries. Most people will have the other needed ingredients on hand to complete their banana bread. I didn't include fresh bananas in my basket, but that is something else you could add. Spread out the cloth napkin inside the basket, tucking in the edges all the way around. 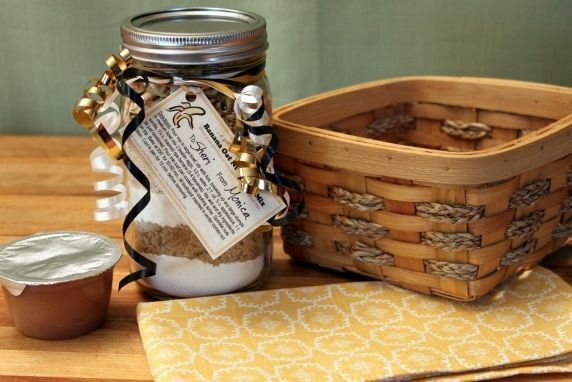 Insert the jar of mix and the applesauce, and your gift basket is complete! 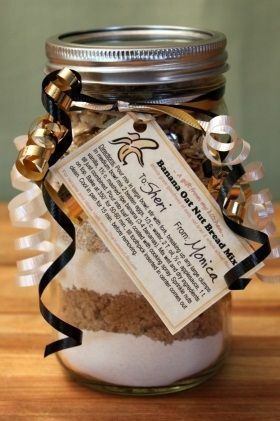 Now you can give someone else a yummy day with this fun, homemade gift.